Is sustainable beef all talk and no action? There’s been a lot of talk about sustainable beef. However, the question is will it ever translate into action? And if it does, what will action look like? You may have noticed the large number of industry events that are either focused on sustainability or weave the topic into their agenda. Seems like almost every industry meeting these days has sustainability as a component of the event. Often these events either focus on comparing the sustainability of beef industry of 1970 versus today or discuss the developing definition of sustainable beef, which seems to be coalescing on beef that is environmentally friendly, socially responsible, and economically viable. That is a broad sentence that nicely sets the boundaries of sustainability. However, it leaves most of us wondering what it means from a management perspective and how exactly is environmentally friendly, socially responsible, and economically viable beef accomplished from a day-to-day, on-the-ground management perspective? Those are important questions that people from both within and outside the beef industry are busy attempting to answer. And that’s important. If the beef industry is to accomplish continuous improvement in the area of sustainability, it must first find answers to those questions. 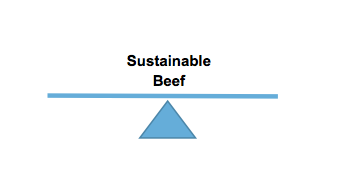 So how are the many diverse stakeholders attempting to “actionalize” the definition of sustainable beef, and what is the range of approaches that are starting to take shape? The challenge is that even with the newly developed definition, there remains a wide range of opinions concerning what sustainable beef is, and what actions are required to achieve it. The differences of opinion concerning needed action range from status quo, keep doing what the industry has always done, to reducing beef consumption. Confusing the issue even more is the proliferating number of marketing efforts attempting to capitalize on the public’s increased focus on sustainability by claiming their beef is “sustainable.” Without a broadly accepted way to verify a marketing claim concerning sustainability, these unsubstantiated marketing claims that pit one segment of the industry against the rest will only increase and cause even greater confusion. A lack of a common focus by the beef industry on an approach to increasing beef sustainability, and how to show continuous improvement, has resulted in the majority of voices on the issue advocating for approaches that are tilted toward extreme change. For example, the Meatless Monday campaign was developed in the void created by a perceived lack of action on sustainability issues by the meat industry. A better, more balanced approach is to place action toward continuous improvement of beef sustainability at the focal point, creating a balanced approach toward continuous improvement. This will allow the beef industry the opportunity it needs to work collaboratively for positive improvement in sustainability. Unfortunately, overcoming the current status quo approach within the beef industry has its challenges. For example, how many beef producers understand the need for and have in place a grazing management plan? A drought plan? A conservation plan? A management succession plan? How many producers have a profit motive that drives them to understand their true cost of production? How many cattlemen are BQA certified? How many cattlemen, and more broadly beef value chain participants, understand the pressure being applied by groups advocating for extreme approaches to beef sustainability? Certainly, there is room for continuous improvement; however, right now the loudest voices in the room are those advocating for extreme change. The consuming public, especially millennials, are increasingly concerned about health and wellness, not just for themselves but for society and the environment, food safety, worker’s well-being, and animal welfare. Given that these elements are all within the sustainability framework, it is reasonable to expect the current focus on sustainability will last for the foreseeable future. The question is how long will the increasingly concerned consumer segment permit the focus on sustainable beef to be high-centered on talk alone? If for no other reason, the beef industry should put forward a unified, concerted effort toward demonstrating real and measurable on-the-ground improvement on beef sustainability, in order to meet the increasing consumer demand for a beef product the consumer will feel good about eating. Weech is a consultant and adviser on sustainable agricultural projects. Contact him at bryanweech@gmail.com.